Three news reports are enclosed reporting on the grave setbacks to Kurdish national aspirations that have taken place in northern Iraq in recent days. Two parts of the story are missing from most reporting of recent events in northern Iraq. One is the longstanding proposals by Russia that countries with large Kurdish populations (Syria, Iraq, Iran, Turkey) consider adopting federal constitutions which recognize Kurdish autonomy (see further below for weblinks to this story). The other is the gamble taken by Kurdish forces in Iraq and Syria in recent years that the U.S., Canada and large EU countries that are intervening militarily in these two countries would act as sincere defenders of Kurdish national rights. Kurds have been under grave attack for years by ISIS and other rightist, jihadi forces and also by NATO-member Turkey. Editors of New Cold War.org will continue to report on this issue as objectively as we can. Elite Iraqi security forces have captured the Kurdish government headquarters buildings in the centre of Kirkuk with the Iraqi Prime Minister Haider al-Abadi ordering the Iraqi flag to be raised over Kirkuk and other disputed territories. An Iraqi Oil Ministry official said that it would be “a very short time” before the Iraqi military seized all the oilfields in Kirkuk province. The century-old movement for Kurdish independence has suffered a calamitous defeat as Iraqi military forces retake the Kirkuk oil province, facing little resistance so far from the Peshmerga fighters. Kurdish officials accuse part of the forces belonging to the Patriotic Union of Kurdistan (PUK), one of the two main Kurdish parties, of “treason” in not resisting the Iraqi assault. Iraqi Kurdish dreams of achieving real independence depended on controlling the oil wealth of Kirkuk which is now lost to them, probably forever. Such autonomy as they did have will be curtailed, with Turkey announcing that it will hand over control of the border gate between Turkey and Iraqi Kurdistan to the central government in Baghdad. The Iraqi government operation began early on Monday morning as troops swiftly seized two major oilfields and the headquarters of the North Oil Company. 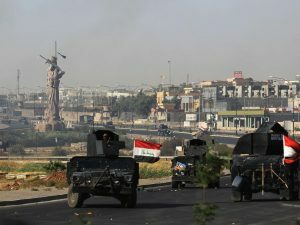 A convoy of armoured vehicles from Baghdad’s highly-trained and experienced Counter-Terrorism Force, which led the attack in the battle for Mosul, drove unopposed to the quarter of Kirkuk occupied by the governor’s office and other administration buildings. Iraqi oil officials in Baghdad say that the Kurdish authorities of the Kurdistan Regional Government (KRG) had tried to close down oil production by evacuating oil workers but that output would soon be resumed. The Kurds seized Kirkuk city in 2003 at the time of the US invasion and expanded their area of control in 2014 when the Iraqi army in northern was defeated by Isis. The streets in Kirkuk city were deserted in the morning as people stayed in their houses or fled to KRG territory further north. So far there has been little shooting as the Peshmerga abandoned their positions in what appears to have been a prearranged withdrawal. The city has a population of one million made up of Kurds, Arabs and Turkmen, the latter two communities hostile to Kurdish rule. A resident of Kirkuk said today that ethnic Turkmen were firing guns into the air in celebration of the takeover by government forces. Mr Abadi told his security forces in a statement read on state television “to impose security in Kirkuk in cooperation with the population of the city and the Peshmerga”. He called on the Peshmerga to serve under federal authority as part of the Iraqi armed forces. Coming after the recapture of Mosul from Isis in July after a nine-month siege, Mr Abadi will be politically strengthened by his victory over the Kurds whose commanders had promised to defend Kirkuk to the end. The speed and success of the Iraqi military advance against negligible resistance so far is a blow to President Masoud Barzani who ignited the present crisis. He did so by holding a referendum on Kurdish independence on 25 September that was greeted with enthusiasm by Iraqi Kurds. But it was adamantly opposed by the Iraqi central government, Iran, Turkey as well as traditional Kurdish allies such as the US and Europeans, leaving Mr Barzani isolated in the face of superior forces. The referendum is seen, even by many of those who originally supported it, as a disastrous miscalculation by Mr Barzani. Kamran Kardaghi, a Kurdish commentator and former chief of staff to Iraqi President Jalal Talabani, who died last week says that “the Kurdish leadership never expected that there would be such consequences to the referendum.” Omar Sheikhmous, a veteran Kurdish leader, warned before the referendum that it might turn out to be one of the classic misjudgements in Iraqi history, comparing it to Saddam Hussein’s decision to invade Iran in 1980 and Kuwait in 1990. He feared the referendum, guaranteed to alienate all the Kurds’allies, would turn out to a political error with similar calamitous consequences. The withdrawal of part of the Kurdish forces is ultimately a reflection of deep divisions between the Kurdish leaders and their parties, whose rivalry has always been intense. The two main political parties, the Kurdistan Democratic Party (KDP) led by Masoud Barzani and the Patriotic Union of Kurdistan (PUK), founded and led for decades by Jalal Talabani, have always had separate armed forces, intelligence and political management. The KDP, strongest in west Kurdistan, fought a savage civil war with the PUK, based in the east, in the 1990s. Kirkuk was always considered PUK territory, though its PUK governor, Najmaldin Karim, has recently inclined towards support for Mr Barzani’s policies. Part of the PUK, much divided since its leader Jalal Talabani suffered a stroke and sank into a coma, opposed the independence referendum as a manoeuvre by Mr Barzani to present himself as the great Kurdish nationalist leader. Ala Talabani, leader of the PUK parliamentary delegation in Baghdad, was shocked at the funeral of her uncle, former Iraq president Jalal Talabani last Friday, to find that the Iraqi flag had been removed from the coffin and there was only a Kurdish flag. The US has been closely allied to the Kurds in Iraq and Syria, but strongly opposed the independence referendum which it saw as provocative and divisive. Washington has called for “all parties to immediately cease military action and restore calm,” adding that Isis remained the true enemy of all parties in Iraq and they should focus on its elimination. President Trump’s denunciation of Iran when he decertified the deal over its nuclear programme last Friday could have energised Iran, traditionally a supporter of the PUK, to back an Iraqi government offensive in Kirkuk. The Iranians have always been worried about Iraqi Kurdistan becoming a base for US forces that could be used against us. A simpler explanation for what happened is that the Kurdish leadership was more divided than expected and the Iraqi armed forces stronger, while Mr Barzani had alienated his traditional allies. A meeting of Kurdish leaders attended by Kurdish leaders on Sunday called for mediation and a non-military solution to the crisis, but by then it was too late. Over the last two days, Kurds may have lost 40 per cent of the territory they previously controlled as they withdraw from areas long disputed with Baghdad. Kurdish Peshmerga fighters are pulling back from a great swathe of land in northern Iraq stretching from Syria in the west to Iran in the east. It is becoming clear that the two main Kurdish parties, the Kurdistan Democratic Party (KDP) and the Patriotic Union of Kurdistan (PUK), both agreed at a meeting on Sunday that they had no choice but to withdraw from Kirkuk and other disputed territories. They knew that they were too weak to fight the Iraqi security forces and they had no allies to whom they could appeal for help. Kurdish leaders are now blaming each other for the debacle, which will go down as one of the great disasters in Kurdish history. The political geography of northern Iraq is be transformed, much to the disadvantage of the Kurds. Kurdish military units have retreated from the Sinjar region close to the Syrian border which is home to the Yazidis who were massacred and enslaved by Isis when they advanced in August 2014. A paramilitary force made up of Yazidis but owing allegiance to Baghdad has taken over. At the other end of the dividing line between Kurd and non-Kurd, Peshmerga have left the towns of Khanaqin, Jaloula and Mandali close to the Iranian border north east of Baghdad. These are all places where the Kurdish parties had exerted themselves to firmly establish their rule in the last few years and are now lost, probably forever. Peshmerga have also abandoned the last two oilfields they held near Kirkuk city, thus ceding all the gains the Kurds have made territorially since the US invasion and the fall of Saddam Hussein in 2003. Possession of the Kirkuk oilfields had been considered essential if the Iraqi Kurds were ever going to achieve economic independence. Celebrations are widespread in Baghdad at what is seen as a second great victory for Iraq and the Prime Minister Haider al-Abadi this year. The first success was the capture of Mosul after a nine-month siege in July and the second is the unexpectedly easy defeat of the Kurds this week in the wake of their self-destructive referendum on independence on 25 September. “What I fear now is triumphalism in Baghdad where there is talk about enforcing central government authority everywhere in Iraq,” said one Kurdish commentator who did not want his name published. This might mean Baghdad putting heavy political and military pressure on the three Kurdish provinces that make up the Kurdistan Regional Government and which now look vulnerable. The Iraqi President Fuad Masum, himself a Kurd, has called for dialogue between the central government and the Kurdish leaders to resolve the crisis sparked by the referendum. Mr Abadi referred to the referendum as “finished and a thing of the past” but also called for dialogue “under the constitution”, which would rule out Kurdish independence. There is no doubt that the balance of power has swung dramatically towards Baghdad and away from the Kurdish capital Irbil. Mr Barzani and his KDP party sought on Monday to blame the PUK Peshmerga for the unopposed advance of the Iraqi security forces, accusing them of betraying the Kurds by reaching a separate deal with Baghdad. But Kurdish sources have told The Independent that both KDP and PUK had agreed that they were too weak to fight for Kirkuk, though orders did not reach all Peshmerga commanders in time. A hospital in the Kurdish city of Sulaimaniyah says that it has received the bodies of 25 dead fighters and treated 44 wounded. Overall, casualties on both sides have been slight which is evidence that a deal on withdrawal had been struck before the Iraqi government advance. KDP Peshmerga withdrew from Sinjar on Monday and from the positions they held in Kirkuk province in what was evidently a prearranged retreat. Mr Barzani himself is blaming “unilateral decisions taken by Kurdish politicians”, an accusation that presumably does not include himself though his ill-judged decision to hold a referendum brought on a confrontation with Baghdad in which the Kurds held much the weaker hand. The referendum was opposed by all international and regional powers with the exception of Israel and Saudi Arabia, neither of whom was in a position to be of any practical help to the Kurds. Mr Barzani also chose to challenge Mr Abadi just after his armed forces had won a big victory in Mosul and he was unlikely to back down. Responsibility for the disaster will be debated by Iraqi Kurds for decades to come, but in practice it was the result of Mr Barzani overplaying his hand and divisions between Kurdish parties which meant that they did not have a military option against Baghdad. Thanks to the referendum, the Iraqi Kurds have not only will they have failed to win independence, but will find the autonomy they previously took for granted under threat as Baghdad tightens its control on the Kurdish provinces. Many Kurds will see the hand of Iran and the Islamic Revolutionary Guard Corps (IRGC) as manipulating the Baghdad government and the Kurdish parties to produce the present outcome. Iran will be pleased that the Baghdad government has been strengthened and Mr Barzani, who is traditionally close to the US, has been weakened, but there is no need for conspiracy theories to explain what happened. Essentially, Mr Barzani started a confrontation which he could not win. It was in 1916, in the midst of World War I, that Britain and France (pitted against the Germans, Austrians and Ottoman Turks) made their infamous Sykes-Picot agreement. In grand imperial style, they used this agreement to divide up the Middle East between them. It was a daring move, considering that the war was at a stalemate and the two allies did not know if they were going to win the struggle. Nonetheless, they went ahead with the agreement and in doing so made a number of decisions that continue to shape the region to this day. Besides bringing traditional European imperialism forward into the Twentieth Century, what made Sykes-Picot infamous was the fact that it broke a significant previous promise made to the Arabs. By 1916 the Arabs had taken to the battlefield against the Turks. For their doing so, the British had promised to support the creation of a large Arab state. But this promise had always clashed with the imperial ambitions of Britain and France, and so, in the end, they secretly conspired to betray their non-Western ally. Among the eventual consequences of this betrayal, the “Arab state” was confined to what is, today, Saudi Arabia; Palestine (which originally was to be part of the Arab state) would become a “national home for the Jews”; Syria went to the French, and much of the rest of the region was given over to the British. The Sykes-Picot agreement allowed for one further change. It made possible a state for the Kurds – a people who constituted the fourth largest ethnic group in the Middle East. This state, known as Kurdistan, was to be carved out of territory within the eventually defeated Ottoman Empire. This intent was publicly confirmed in the Treaty of Sevres in 1920. The Kurdish leaders, who by this time must have been aware of the Western powers’ betrayal of the Arabs, therefore should not have been surprised when, despite the treaty, the British and French betrayed them as well. The 1923 Treaty of Lucerne amended the Treaty of Sevres, and sure enough, the state of Kurdistan was omitted. The lands that would have made up the Kurdish nation instead become parts of Turkey, Syria and Iraq. Thus, the Kurds remained stateless. However, they never gave up statehood as a goal. Now we can fast-forward to March 19, 2003, the date that President George W. Bush took the fateful step of invading Iraq. Bush had an array of flimsy excuses for doing this: Saddam Hussein’s non-existent nuclear weapons and other WMD, Saddam’s alleged plot to assassinate Bush’s father, the dream (really the nightmare) of forceable “regime change” as a way of making the Middle East safe for the U.S. and Israel, or perhaps just the cutting loose of neoconservative bellicosity. Whatever the President’s depth of ignorance led him to anticipate, the invasion set loose forces that Bush and his White House successors have been unable to control. Among these are the consequences that followed the falling apart of Iraq. 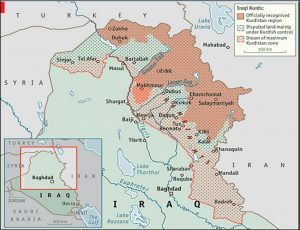 Like the Arabs in World War I, the Kurds became a fighting ally of the West in the aftermath of the invasion of Iraq and the subsequent Syrian civil war. The region’s chaos allowed for the emergence of the “Islamic State of Iraq and the Levant” (aka ISIS, ISIL, and Daesh). ISIS turned out to be a grim and brutal manifestation of religious fanaticism run amok. Its growth threatened just about every state in the region, as well as the citizens of the European Union and the U.S. If stability was to eventually prevail, ISIS had to be defeated, and the Kurds played (and continue to play) a notable role in this fight. There is little doubt that one of their goals in doing so is to create favorable conditions for a Kurdish state. For all those regional powers (Turkey, Iran, Syria, Iraq) seeking to reestablish the status quo ante, the prospect of an independent Kurdish state is anathema. Each state has Kurdish minorities and is afraid that an independent Kurdistan, even one carved out of another state’s territory, would lead to or exacerbate Kurdish insurgencies in their own countries. The possibility that such a state might instead cause a lessening of minority Kurdish restiveness through voluntary immigration seems not to have occurred to the leaders of Iran, Turkey and Syria. One can hardly blame the Kurds for taking help where they can get it – in this case from Israel – in a fight for independence that has been going on for centuries. Nonetheless, one can also understand that Israeli meddling seriously frightens the other states affected. Leaving aside the Israeli issue for a moment, the question that should guide policy here is: can Iraq be reestablished as a viable state? Putting the question more informally, in 2003 a rather stupid American president — working under the influence of Zionists, witless neoconservatives, and Iraqi nationalists bearing false witness — knocked the Iraqi Humpty Dumpty off its precarious wall. Can it be put back together again? The answer is, well, maybe – but there seems to be only two ways to do this. One is a near-genocidal war waged by regional powers against the Kurds. Alternatively, Iraq might be resurrected if the Kurds are willing to settle for half a loaf in the form of being an autonomous part of a confederated state. Right now the future is uncertain. One has the impression that the Turks and Iraqis (whose forces assaulted the Kurdish claimed city of Kirkuk on Oct. 16) are quite willing to try to solve the matter by prolonged war. This would be a big mistake. It would lead to an Iraq that may be technically united but in truth would be even weaker than it is now, and not really independent at all. Its northern region would probably be under the de facto control of Turkey and Iran, and the rest of the country would continue to be in a decentralized mess experiencing an ongoing sectarian civil war. On the other hand, a peaceful resolution of the Kurdish issue could lead to the stabilization of the rest of Iraq as a confederated state. Also, as part of a confederated Iraq, Kurdistan’s autonomy can preclude an independent foreign policy, thus minimizing Israeli influence. Despite the recent Kurdish vote for independence, their leaders must know this can only be made real if they can win a prolonged war against Turkey, Iran and Iraq. Israel is not in a geographical position to effectively help them do this. And so, the Kurds probably cannot endure such a struggle. That leaves them with only one rational choice. The Kurds are now closer to independent status than at any time since the near-miss days of World War I. Their best strategy is to make the best (if not the most) of that status within a confederated Iraq and end their interaction with Israel. This has to be better than a near-genocidal war in which they would be the victims. However – and this is the usual question in such situations – will the emotions roiling on all sides allow sanity to prevail? The author fails to report the diplomatic proposals made by Russia for more than one year now that a fair resolution of Kurdish national aspirations would be the establishment of federal constitutions in the countries with large Kurdish populations granting autonomous status to Kurdish regions. Russia has made a particularly strong (and compelling) case to the Syrian government that it modify its constitution along these lines. See reports on New Cold War.org here, here and here.